Since we started in 1988, our head chef Moina has been preparing our sumptuous dishes using the finest of ingredients and with more than three decades of experience. 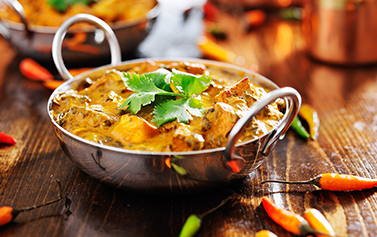 All of our dishes are prepared and cooked from fresh to ensure that you the customer enjoys the Palace of India dining experience. Some of our most popular dishes are the lamb shank bhuna,tandoori jinga bhuna,murgh shashlik masala and of course the chef' special chicken. If you require a dish that is not on our menu, please ask as we will always endeavour to meet your requirements. Our bar has an extensive wine menu for you to choose from and we stock lagers such as Cobra, Bangla and Kingfisher. We also offer a free home delivery service (within a 4 mile radius) with a minimum order of £15.00. Just to let you know we also offer a buffet for Sunday lunch which you can eat as much as you like from a choice of between 12 and 13 dishes and has proven to be a winner for many of our customers.